These things were SO awesome. I did a little semi-homemade kind of deal with them because I was strapped for time, but regardless – this recipe is awesome. 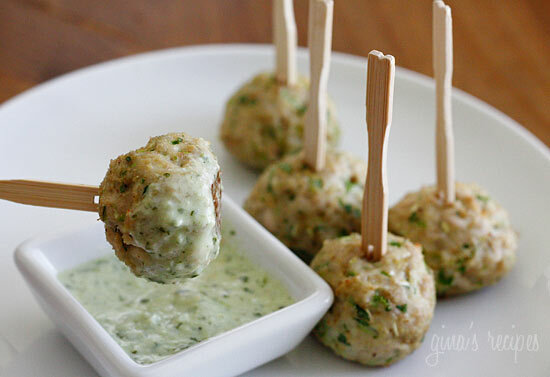 I bought turkey meatballs in the freezer section of Trader Joe’s and just used those. They were a little bit on the larger side once they were cooked so I just cut them in half and stuck wooden skewers that one would normally soak and use as kebab sticks. But the star of this little appetizer that I made for my boyfriend and my Easter dinner was the cilantro dipping sauce. Dez said that the sauce tasted exactly like the dipping sauce he used to serve when he worked at a lovely Mexican restaurant in Nashville. He said they served it cold, but I actually liked it a little warmed up. Try it out! And definitely let me know what you think. I found this recipe off of Pinterest and I am an absolute Pinterest addict. Just another recipe to check off of my “Nom Nom” pin board! I can’t wait to make all of the recipes that I pin!